Belthangady, Dec 7, 2015 : A 19 year old engineering student is feared drowned n the Holegandi river near the Parashurama Temple near Kokkada while enjoying a swim along with his friends on December 6, Sunday. The missing student is Ajay. 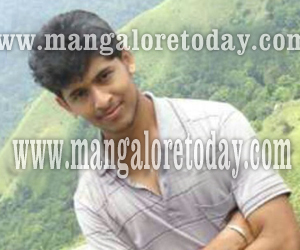 He was the only son of Lakshminarayan Bhat of Parpikal and was a first year student at SDM Engineering College, Ujire. It has been gathered that he had been to the river along with his friends Annesh, Chandan Khare and Vrikshavardhan at around 1 pm to swim. Ironically, of the four friends only Ajay was adept at swimming while others were not, giving room for some doubt. Sources say Ajay who was having a bath had suddenly begun o scream for help and the efforts of his friends to rescue him went in vain. The boys soon informed those at the temple and a search for Ajay was of little help. Later, a team of expert divers from Golitottu and Nelyady arrived and began searching for Ajay. Uppinangady SI Timmappa Naik and other police personnel were present during the search operations. Search is expected to resume today. Recently so many guys me a watery grave we read the news but fall in the same ditch carelessly. The guys when they are accompanied by friends are unaware of the happenings around. How sad? The guys risk their life. The parents are the sufferers.